On Second Scoop: Ice Cream Reviews: Dairy Queen Salted Caramel Truffle Blizzard ...and Hot Desserts a la Mode?? ...and Hot Desserts a la Mode?? 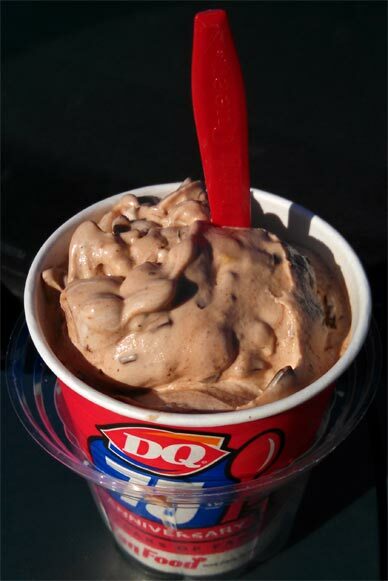 After spending most of 2015 on the fanniversary features menu, the Salted Caramel Truffle blizzard is already back as the January 2016 blizzard of the month. It's almost like it never left.... and then it came back as the January 2017 botm. 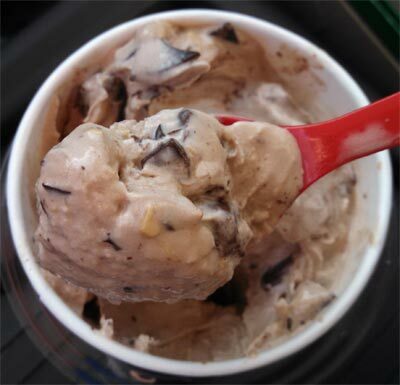 Whoa, wait, my DQ Grill and Chill is offering brand new Hot Desserts a la Mode? Fudge Stuffed Cookie? Apple Tart (my review here)? Triple Chocolate Brownie? Oh man, why must they torment me? Ahhh, no matter, I came for the blizzard and that's what I'm getting! Ok, there are just two points I need to make about this blizzard. How quickly/eloquently I make them is a whole other matter. One : I liked this blizzard.... a lot.... I'm tempted to throw out the other L word. Once I settled in to what this one was, I was kind of enamored with it. The bits of toffee everywhere are really awesome for those of us that love toffee. Two: What in the bloody blue blazes does this have to do with salted caramel truffles? Yes, I get that there are physically truffles in here, but they are just set pieces for the toffee. I mean, good luck tasting the caramel over the toffee. Someone commented on the news post that she returned her blizzard because it tasted nothing like caramel. Think about every salted caramel truffle treat you've ever eaten. Did you ever go "mmmmm, this tastes like toffee!" because I know I never have. So those are my points, an excellent blizzard with the totally wrong name. If this was a Ben & Jerry's flavor, it would have been called Toffee Truffle Tango or something else even funner to say. 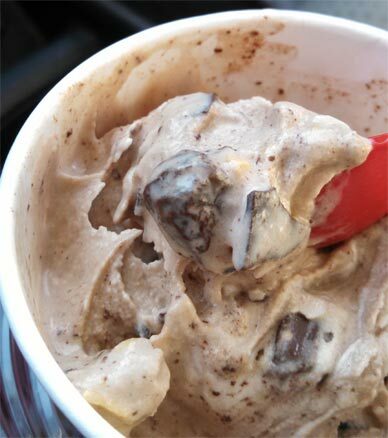 The blizzard is chuck full of munching crunching fun.... just don't get your heart set on the whole caramel thing. *Note: If you look at the menu, you'll notice a disclaimer. See, your blizzard is supposed to be served upside down or it's free, and despite being told this by two different DQ reps, I still forgot to call them out on it when they served it right side up ---- Update: A PR rep is going to send a gift since they forgot --- Update2: Just got a nice gift card to test out many more upside down blizzards, THANKS DQ!! Hmmm maybe they should have blended the vanilla soft serve with caramel sauce instead of their cocoa fudge to amp up the caramel! I wonder if you could request that... in theory you could, quick, somebody go try it! Now that's enough to make one give a double take. DQ has always been a good spot to get ice cream - Even if it is just soft serve. These look really good - Even if it is just a microwaved cake or cookie. just that until getting to the added note at the bottom of the write-up. I just feel like serving something upside down is SOOOOO against the norm, that servers would slip up on doing this quite often. I'm getting the urge to go and test this out. All I could think of when I saw the title of this post was if you had received it upside down! DQ runs that commercial quite a lot. Or I just watch entirely too much t.v. 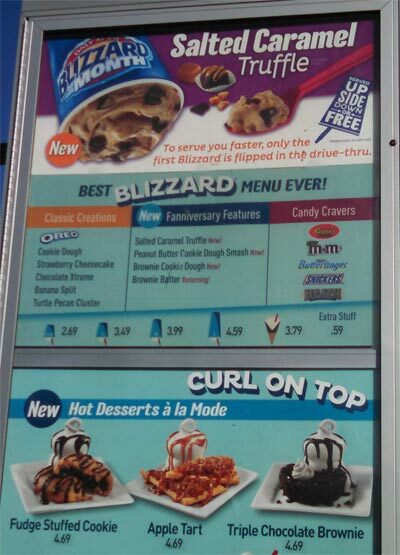 There's only one DQ still open around here, but they always, without fail, serve their blizzards upside down. I thought this was something that DQ was 'famous' for? Okay, twice I have tried this. I love salted caramel but all I taste is chocolate. It sure doesn't look like the ad. All it is, is a health bar crunch blizzard. I am sure with everyone being on the salted caramel band wagon this was an easy way to sell something new! If you want caramel, don't get this! Had been craving this since seeing the commercials for it. HUGE disappointment! Tried taking it back because I thought they gave me a heath bar crunch blizzard by mistake. As another poster said, DO NOT get this if looking for salted caramel because it tastes nothing like that!